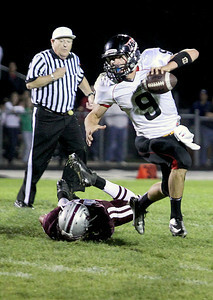 Huntley defeated Prairie Ridge during Friday's game in Crystal Lake on August 7, 2012. 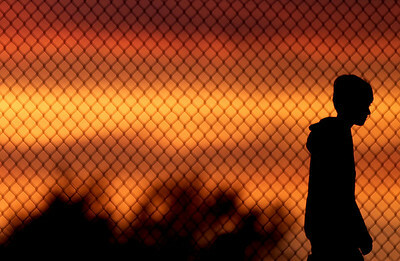 Sarah Nader - snader@shawmedia.com The sunsets during Friday's football game at Prairie Ridge High School on August 7, 2012. 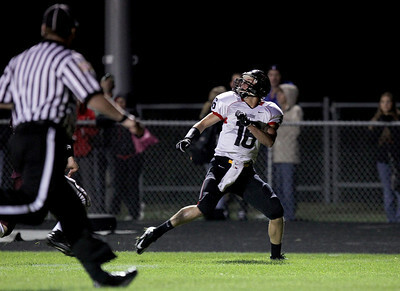 Sarah Nader - snader@shawmedia.com Huntley's Bryce Beschorner eyes the ball before making the touchdown pass during the first quarter of Friday's game against Prairie Ridge in Crystal Lake on August 7, 2012. 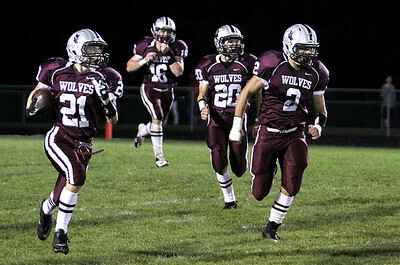 Sarah Nader - snader@shawmedia.com Prairie Ridge player before Friday's game in Crystal Lake on August 7, 2012. Sarah Nader - snader@shawmedia.com Prairie Ridge's quarterback Oliver Kremer the first quarter of Friday's game in Crystal Lake on August 7, 2012. 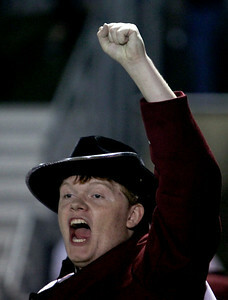 Sarah Nader - snader@shawmedia.com Casey Wharton, 17, of Crystal Lake cheers on Prairie Ridge while play with the Prairie RIdge marching band in Crystal Lake on August 7, 2012. Sarah Nader - snader@shawmedia.com Prairie Ridge's Matt Perhats (left) brings the ball down field during Friday's game in Crystal Lake on August 7, 2012. 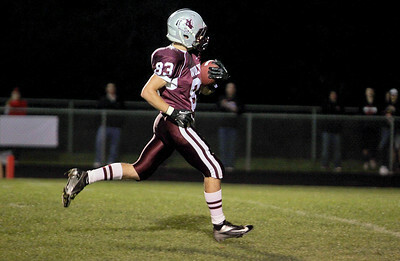 Sarah Nader - snader@shawmedia.com Prairie Ridge's Ross Carpenter scores a touchdown during the second quarter of Friday's game against Huntley in Crystal Lake on August 7, 2012. Sarah Nader - snader@shawmedia.com Huntley's quarterback Kam Sallee throws a pass during the first quarter of Friday's game against Prairie Ridge in Crystal Lake on August 7, 2012. Sarah Nader - snader@shawmedia.com Huntley's Damario Hughes (left) runs up to tackle Prairie Ridge's Steven Ladd during the first quarter of Friday's game in Crystal Lake on August 7, 2012. 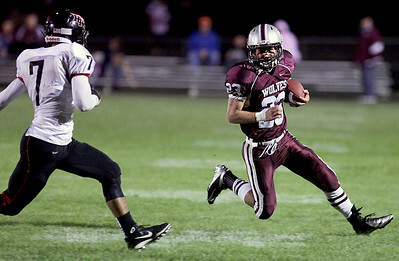 Sarah Nader - snader@shawmedia.com Huntley's Jake Scalise (left) runs past Prairie Ridge's Sean Folliard during the second quarter of Friday's in Crystal Lake on August 7, 2012. Sarah Nader - snader@shawmedia.com Prairie Ridge's Kevin Grant falls to the ground while trying to sack Huntley's quarterback Kam Sallee during the second quarter of Friday's in Crystal Lake on August 7, 2012. 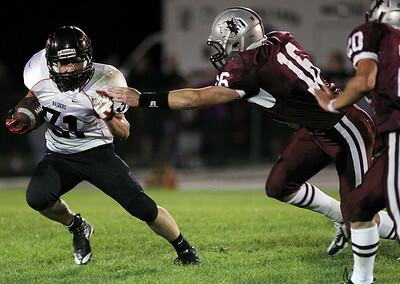 Sarah Nader - snader@shawmedia.com Huntley's Jeff Chan (right) tries to block a pass by Prairie Ridge's quarterback Oliver Kremer during the second quarter Friday's game in Crystal Lake on August 7, 2012. 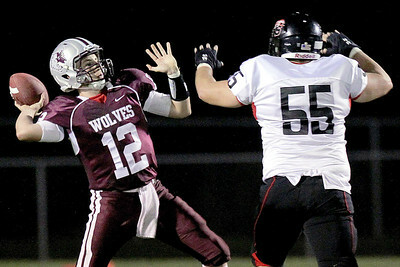 Huntley's quarterback Kam Sallee throws a pass during the first quarter of Friday's game against Prairie Ridge in Crystal Lake on August 7, 2012.